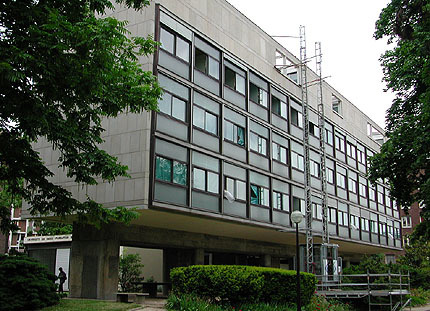 Cité universitaire was founded in 1921 to provide accommodation and support for foreign students in Paris, with a number of residential pavilions endowed by different national communities. 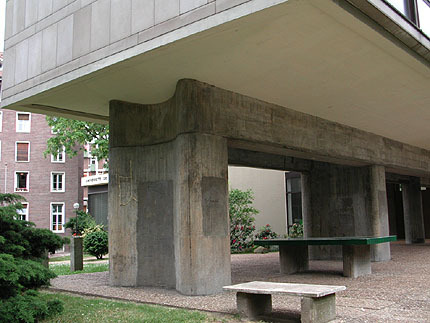 Le Corbusier was commissioned by the Swiss community in the late 1920s. The pavilion adheres to Le Corbusier's 'five points of architecture', but with a number of developments since the Villa Savoye. 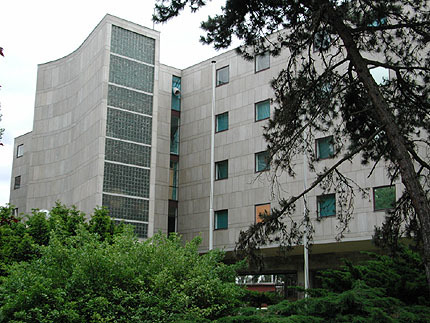 The free facade and horizontal window have become a continuous glazed curtain wall, on the south side of the building (above). The pilotis have developed from thin columns to six massive reinforced concrete 'dog-bones' or 'thighs' with their characteristic figure-of-eight cross section to withstand winds. While the client accepted the student rooms being raised in mid air, the public spaces were required to be on the ground. The plan accommodates them in a separate block sitting on the earth, its curvaceous form contrasting with the simple slab of the student accommodation. After a period of renovation, the building is now open to the public again. Opening hours are weekdays 10am-12pm and 2-5pm. Le Corbusier's original architectural 'manifesto', describing what he sought to achieve, as it first appeared in English in 1931. Accessible (if an unconventional style for today) and stimulating. Readable (quite detailed) account of Le Corbusier's work, well illustrated and well structured. A hefty but accessible analysis of Le Corbusier's life and work, drawing on his writing and painting as well as building design.